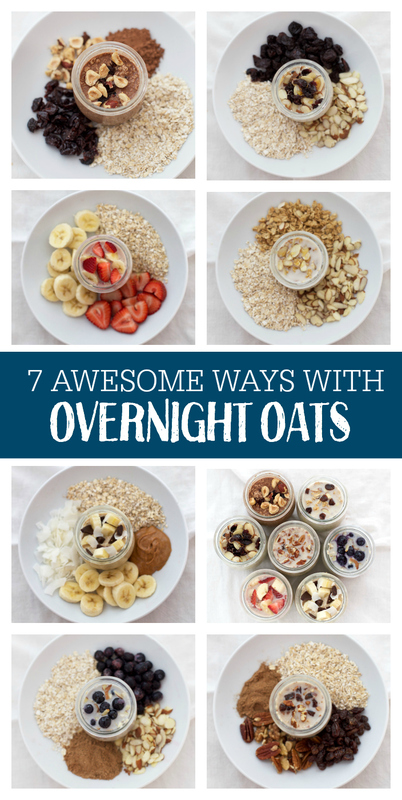 7 Awesome Ways with Overnight Oats – Find out what all the fuss is about. Overnight oats are a delicious make-ahead breakfast the whole family will love. And with this many flavors (and inspiration for more! ), you’ll never run out of ideas! 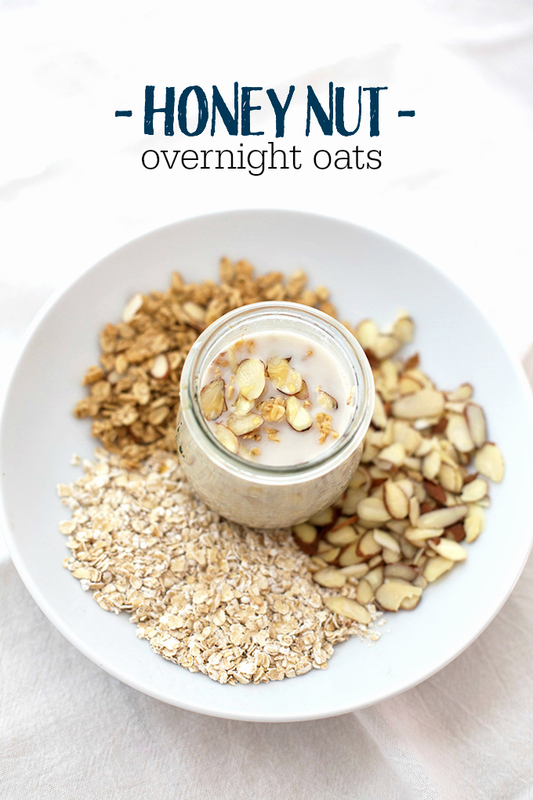 Overnight oats are nothing new–they’ve been on the scene for years–but it seems like they’re going through a big revival lately, as I see recipes popping up all over the place. Everyone makes their oats a bit differently–some people love adding yogurt for a more muesli effect, some people always add chia seeds, some only add mix-ins right before serving. 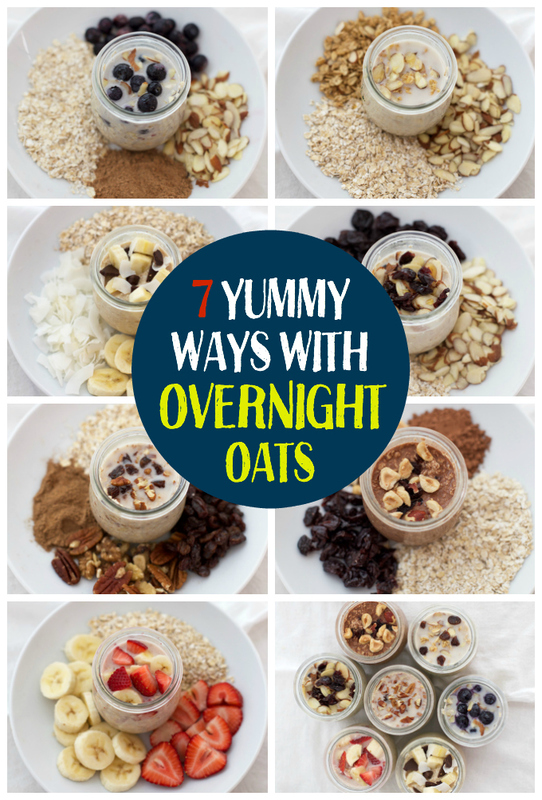 I thought I’d walk you through the basics of overnight oats, as well as 7 different ways to make them (one for every day of the week!). Let’s get to it! Which oats to choose? You can use rolled oats or quick-cooking oats for these bowls, depending on the texture you prefer. My kids find rolled oats a little too…textured…for their liking, so for them, I stick with the quick cooking oats. For myself, I use whichever I have on hand! Also, if you’re gluten free, be sure to use certified gluten free oats. We love Bob’s Red Mill and Trader Joe’s has great-quality rolled oats too. What about steel-cut oats? Aren’t they healthier? Few things are more awesome than an incredible bowl of steel-cut oats! However, I’ve found that steel cut oats don’t soften enough for most people when used for overnight oats. Maybe you like the chewy texture, and if so, more power to you! Do your thing! For my family, the end result is still too chewy, so I save those for the colder months when I’m making warm oatmeal. As a side note: It’s a myth that quick-cooking oats are less nutritious than old-fashioned or steel-cut oats. All of these forms of oats are whole grain oats. The different forms are simply a matter of preparation. Steel-cut oats are whole oat kernels cut with a large steel blade into larger pieces. Old-fashioned oats are steamed and rolled to press them thin. Quick cooking oats are steamed and rolled even thinner/finer to cook more quickly. ALL are whole-grain oats. Get toasty. 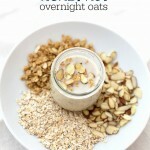 I prefer to make my overnight oats with toasted oats. This is a REALLY quick step that makes a big difference for me. I love the subtle toasted flavor and I think it adds something nice to the texture. I do this when I’m washing dishes after dinner. I shake 3-4 cups of oats (old-fashioned or quick-cooking) onto a baking sheet and bake at 350 degrees for 10-15 minutes. Let them cool completely and transfer to a jar (these are the ones I used) or airtight container to use throughout the week. You can totally skip this step if you forgot or don’t have time. Combine all ingredients in a jar. Refrigerate at least 2 hours or overnight. Add additional milk, if needed and top with chocolate chips! Combine all ingredients and store in a bowl, jar, cup, or airtight container fitted with a lid/plastic wrap. Refrigerate at least 2 hours, preferably overnight. Fresh or freeze-dried strawberries work well for this recipe. If you haven’t tried them, freeze-dried strawberries are crunchy when eaten plain (they’re not the same as dehydrated). 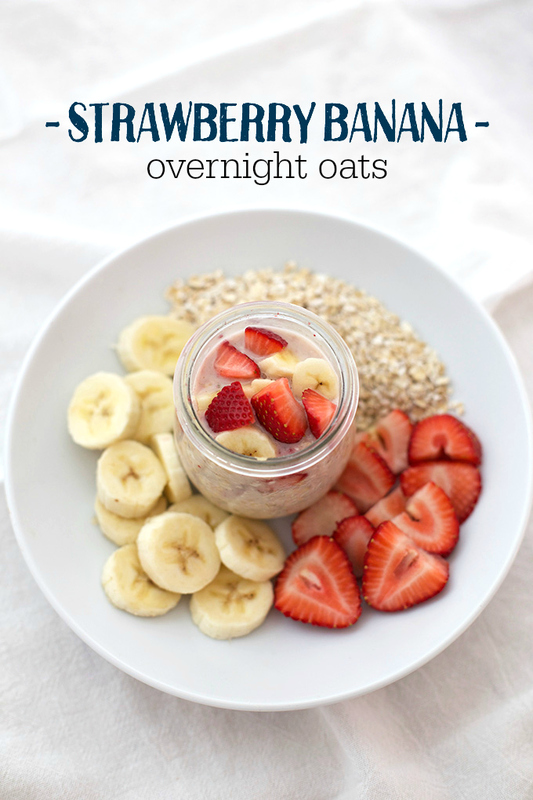 They soften up nicely in overnight oats, and they’ll lend more pink color if fresh ones aren’t in season. Combine all ingredients and place into a jar, cup, or airtight container. Cover with lid or plastic wrap and refrigerate at least 2 hours, preferably overnight. Stir before serving and add more milk, if desired. This is a GREAT basic recipe. 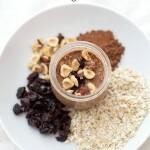 It may sound strange to top with with granola at the end (oatmeal on oatmeal?) but the texture contrast is SO yummy! Combine all ingredients and transfer to a jar, cup, bowl, or airtight container fitted with a lid/plastic wrap. Refrigerate at least 2 hours, preferably overnight. Top with a little bit of granola before serving. Combine all ingredients and place in a jar, airtight container or bowl. Cover with lid or plastic wrap and refrigerate at least 2 hours, preferably overnight. Combine all ingredients and place in a jar, cup, or airtight container. Cover with lid or plastic wrap and refrigerate at least 2 hours, preferably overnight. 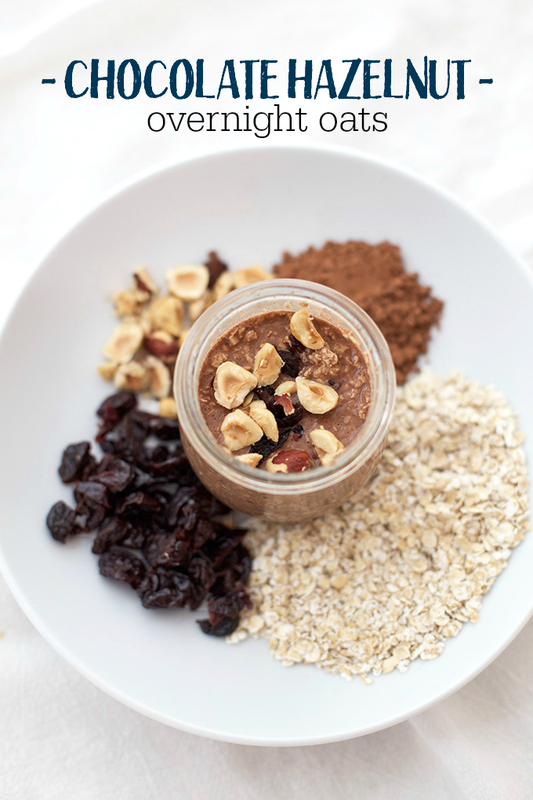 The unsweetened cocoa powder in this recipe mixes best if you stir it into the oats before adding the milk. Also, the longer this sits, the sweeter it gets, so it will taste better after resting overnight than it will after just 2 hours. Stir the cocoa powder into the oats. Add remaining ingredients and stir together. Store in an airtight container, jar, cup, or bowl fitted with a lid or plastic wrap. Refrigerate at least 2 hours, preferably overnight. 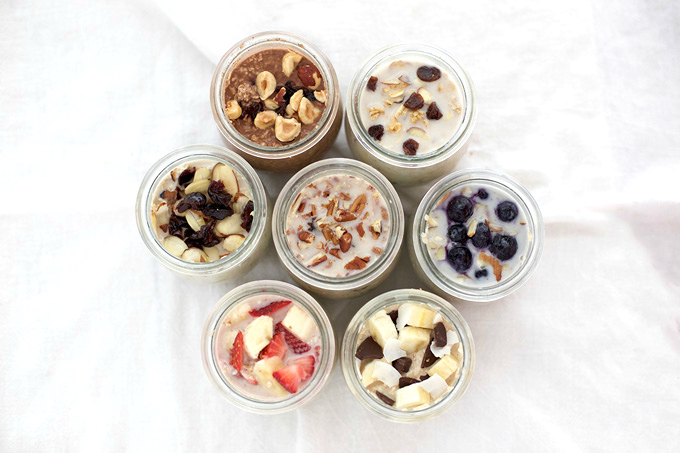 What are YOUR favorite flavors for overnight oats? 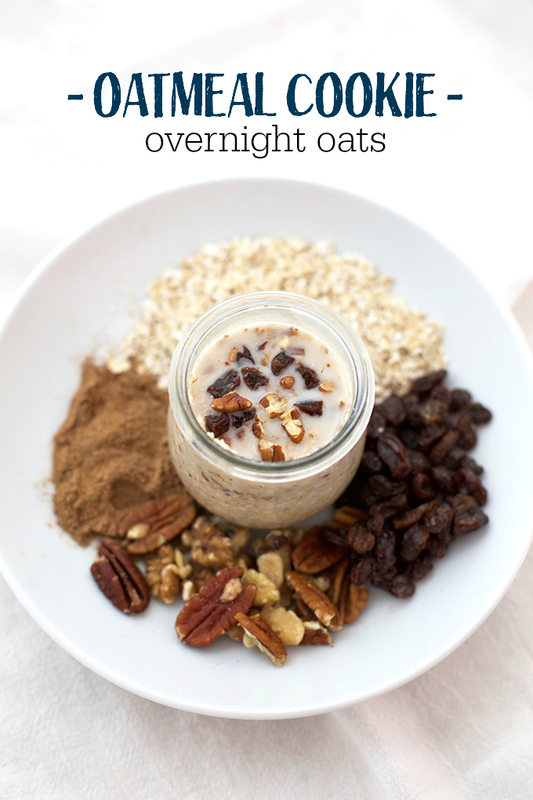 I’ve always wanted to try overnight oats because they look so delicious! One question, do you eat them cold, or do you heat them up in the morning… was that dumb? They look like you would eat them cold, but I just wanted to make sure! Not a dumb question! I eat them cold (it’s like a parfait or rice pudding), but (as long as you haven’t put any yogurt in them) you can pop them right in the microwave like normal oatmeal. Just add an extra splash of milk. They’ll cook faster since the oats have been soaking all night. Just curious…why can’t you put them in the microwave if you use yogurt? Vickie – Mostly, I know that when I’ve tried it with our yogurt (dairy free) it can sometimes sort of “curdle” in the microwave or take on a sour taste. But that’s largely personal preference! 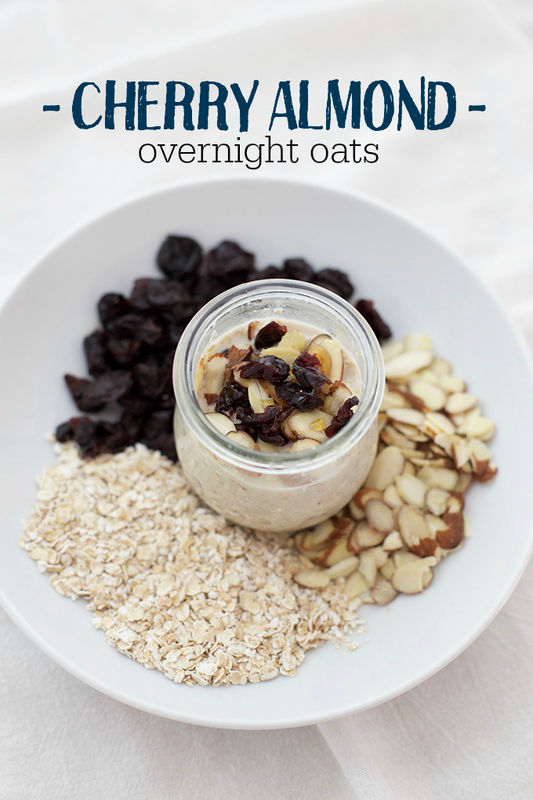 I know lots of folks who like to add yogurt to their hot oatmeal. It’s up to you! I know it’s really weird, but I do flax and spinach, then throw a little cheese in and an egg on top while I microwave them the next morning (or microwave with egg whites). I just prefer savory to sweet and I love getting some greens in my breakfast! That sounds great! I’m almost always a savory breakfast over a sweet breakfast kind of girl myself! Love your photos! Very pretty! And tasty looking too. Thanks! My pleasure! Thank YOU for such a lovely comment. You made my day! You’ve inspired me to finally try some overnight oats. The only problem is deciding which one to try first 🙂 Thanks for these easy & healthy recipes! 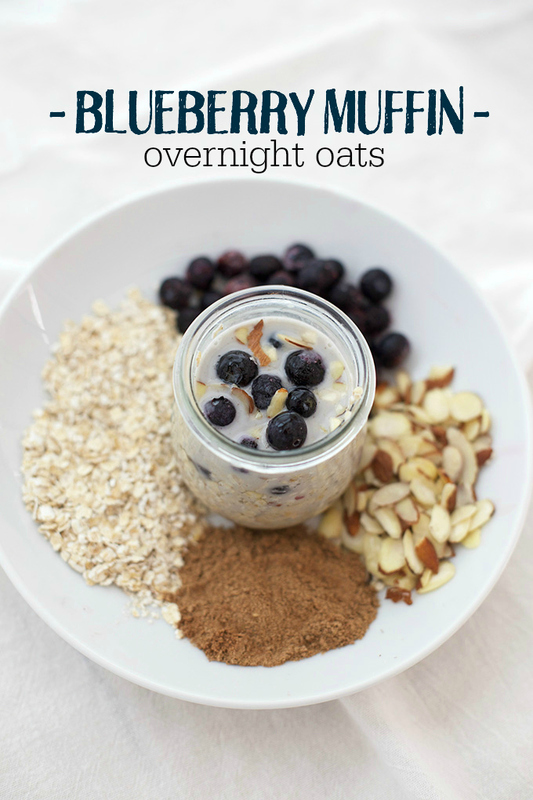 Do you ever add Chia seeds to your overnight oats? If so do you increase the amount of milk? I do! – only 1 tsp or so to each serving. Then I do make sure to add a little extra milk as needed. These look beautiful and delicious! Where did you purchase your darling jars? Thank you so much! They’re Weck jars. I got them here for a good price (waited for a sale and stacked a coupon). They last forever and they’re so cute! 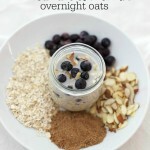 These look great and I am always looking for new ideas with my oats! I have some in the fridge right now that have chia seeds, pineapple, and coconut! I can’t wait to dig into them tomorrow! For the recipes with peanut butter, have you tried the powdered pb2 in them? I’m wondering with the milk if I would need to add the water normally used to mix the peanut butter. 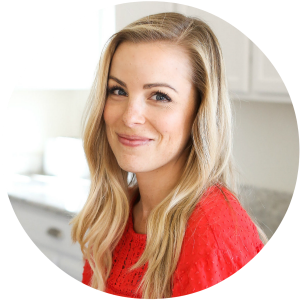 These recipes look great and thanks for the great explanation of what they are for us newbies! Amy – I haven’t tried them with pb2, but I would think you’d probably at least want to add a little extra liquid (since the powder would be absorbing some of the liquid). If you give it a try, I’d love to know how it turns out for you! Sarah – Great question! They do get a bit soggy, but I don’t mind. I can do two at a time without feeling like I’m losing much in the way of texture of flavor. I like prepping ahead of time, too, so I mix up all the dry ingredients in jars (usually for about a week’s worth of jars at a time) and then usually just add the milk and pop them in the fridge right after dinner the night before. Does that help at all? I hope so! How long do they stay good for? Do you make a couple at a time or do you make a single serving each night? I find that the texture starts to get too mushy for my taste after the 3 day mark. What I like to do is pre-measure all the dry ingredients for a week’s worth at a time (they’re shelf stable when dry), then I add milk and any fresh ingredients (like banana or berries) about twice a week making about 3 days at a time. Do you layer everything in the jar, or do u stir it all together before putting in the frig overnight? Alison – I stir everything together before putting it in the refrigerator. Hope that helps! Do you have any information on calories on any of these? Mollie – I’m so sorry I don’t have nutrition facts readily available. You can plug the ingredients into any online calculator. My favorite is MyFitnessPal (either the free app or the website). You can even import recipes straight from the web! How do I import them? From there, you can click “Create a Recipe” and it’ll give you the option to “Add from the Web” or “Enter Ingredients Manually.” I highly recommend entering the ingredients manually for the most accurate results. When you toasted the oats do you put them on parchment paper or anything? Or just straight onto the baking sheet? I’ve never had mine stick since there’s nothing wet on them (no honey or coconut oil, etc.). I just put them right on the baking sheet! If you’re nervous, you can always put parchment or a silicone baking mat under them. Best of luck! These look amazing! Thank you so much Emily. My pleasure, Poppy! I hope you enjoy them! Hi, they look lovely! Can you put them into the freezer or only the fridge? 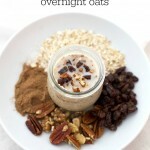 Mia – For overnight oats, they will not work well frozen. Only the refrigerator works for these. You CAN freeze cooked steel-cut oats, so if you’re looking for a make-ahead freezer breakfast, I’d go the steel cut oats route. Hope that helps! What size is the jars? Mine were 7oz jars, which can hold just under 1 cup. You can put them into any size jars you like! I have my strawberry/banana oats in my fridge for breakfast tomorrow. So excited for breakfast tomorrow. 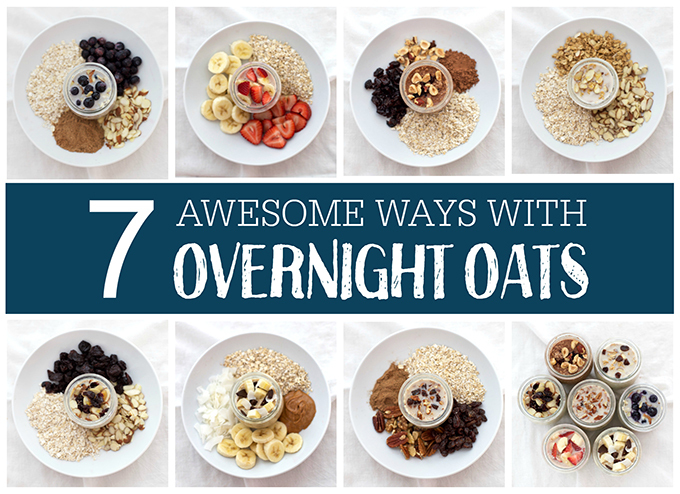 Thank you for the information provided on the variety of oats, I have Quick Cooking Oats at home and I never knew that these can be used for overnight oat recipes. My pleasure, Betty! I hope you enjoy them! 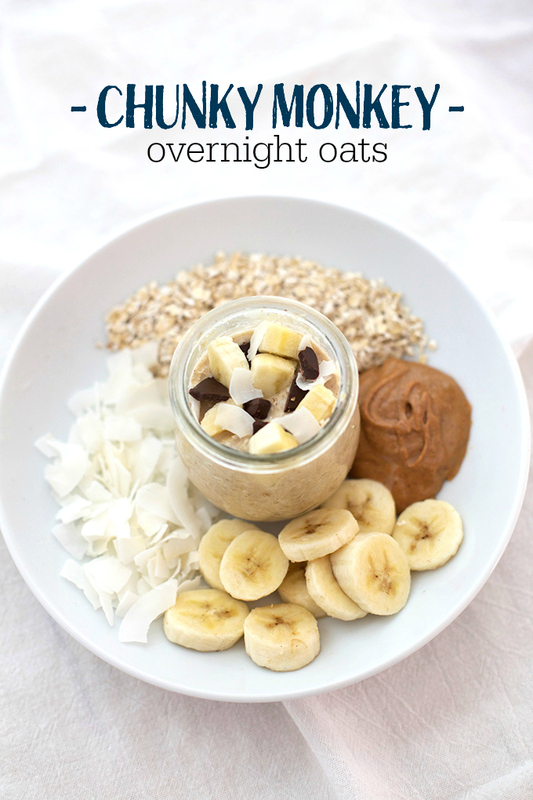 I’ve been wanting to try overnight oats for a while! This gives me a great start! Does it have to be a glass container, or can it be plastic? You can absolutely make it in a plastic container! Hope you love them! 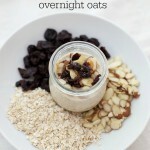 IS it possible to make overnight oats from raw oats? Or do you have to toast them? I tried making overnight oats before but it was too soggy and mushy for me. I prefer chunk, super dry oats. 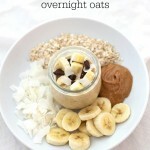 How would you recommend I alter a recipe for say, chocolate banana overnight oats, if i don’t like water, liquidy, soggy oatmeal, however still need the convenience of making oats overnight as opposed to in the morning? Please help! Haven’t been able to figure this out. Deneza – It sounds from this that overnight oats aren’t for you. The texture on these will always be soft because of the nature of the recipe. You might instead prefer doing something like slow-cooker oats or a baked oatmeal recipe (like this berry or pumpkin version). Or, you might prefer making a batch of granola, which will last for several days. I hope this helps! That sounds DELICIOUS! I’m totally trying your oatmeal!!! Wow this is so great I have been in to the Quaker Oats ones this is a way better way of controlling what is in them as well as sugar and calories and Oatmeal Cookie omg yummmm going to the market tomorrow !!!!! Thanks for this!!! I have overnight oat about 4 times a week and I have never thought to toast the oats first. I am definitely going to try this!! It’s a subtle difference, but I really like it that way! I just made the blueberry version and added peaches!!! YUM!! I want to make the chocolate hazelnut version – looks amazing!! Where do you buy your hazelnuts, Emily? Jessica – I’m so glad you enjoyed the blueberry version. Adding peaches sounds amazing! As for the hazelnuts…you can find them in the bulk bins at Sprouts or Whole Foods often (Which is great, since you can buy just what you need). Otherwise, Trader Joe’s and Costco have great prices! So excited to try these!! Do you think adding steel cut oats will help with the mushiness that some others have said they don’t like? Or do you think preparing them at lunch time instead of dinnerime would help soak up some more of the liquid do they wouldn’t be too chewy? Kelly – You could certainly try it. 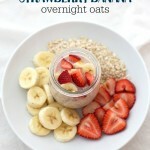 I haven’t personally liked the chewiness of the steel cut oats for overnight oats. But that could very well be personal preference! Do you happen to have a calorie count on the overnight oats? Hello! I was curious if you ever use frozen berries? Elizabeth – I haven’t, but if you don’t mind soft fruit, it’d work great! (Fruit softens quite a bit upon thawing).